The image shown here was taken in September 2011 while setting up the exhibitionDaglig Dosis by Pharmacopoeia at the KunstCentret Silkeborg Bad in Denmark. I work with Dr Liz Lee and textile artist Susie Freeman in the Pharmacopoeia-Art collaboration. Our work presents ‘snapshot’ arrangements or developed essays as art installations about how our society uses medical solutions to maintain health and wellbeing. This collection of fifty-six prints and thirty-five framed ‘butterfly needles’ are in Last Rites, a piece about the moment of our death. Liz Lee and myself asked people how they visualised what they will see at the moment of their own death. Very few people had a precise image but most said something like, “It all goes black”, or conversely, “You see a bright light”. Over many months I took colour photographs of predominantly black and white things that resonated in some way with my own thoughts about that moment. Liz, Susie and other friends contributed images and discussed the choices and layout. The framed needles have been used to give drugs including morphine to patients during their terminal illness. Rather than look for a single image to capture a moment in time, we often use many pictures, objects, documents and of course real pills, to weave a narrative about a method of treatment, a person, or our generic approach as a nation. 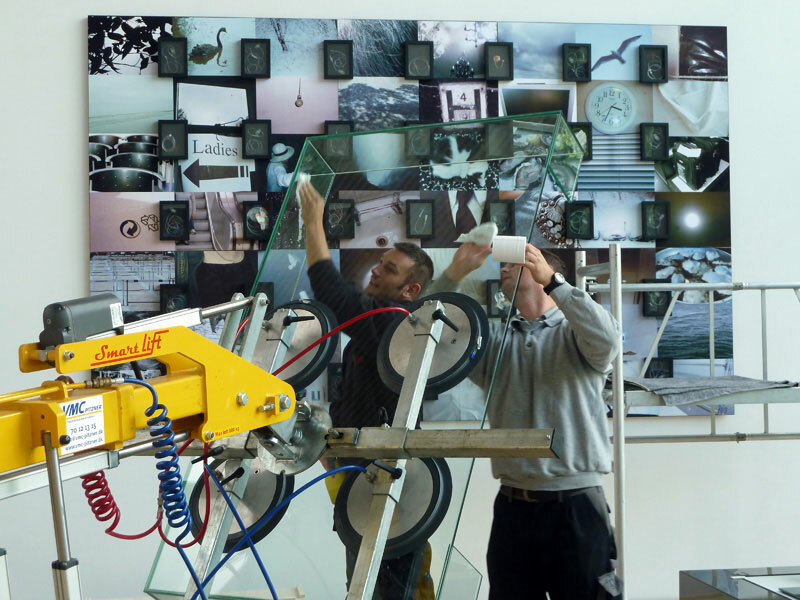 The glass technicians with their heavy-duty vacuum lifting gear are cleaning a plate glass lid before placing it on a related artwork Wieg tot Graf, the Dutch version of our Cradle to Grave installation commissioned for the British Museum, which contains similar drugs, objects and photographs. The key for me in this photograph is the industrial scale of the processes involved in bringing fragile and ephemeral images to a place where they can be seen, contemplated and responded to in a personal way.